CCCC Tianjin Port Engineering Institute Ltd.
Journal of China Harbor Engineering is a scientific and technical journal focusing mainly on port and harbor engineering. 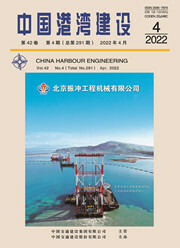 Journal of China Harbor Engineering contains papers and topics on the new achievements and developments in the research, prospecting, design, construction, fabrication and management of port and harbor engineering, waterway and dredging engineering, waterway transport works and their related civil works as well as craft, mechanical and electrical engineering. The aim of the journal is to lay equal stress on both theories and practice, to disseminate both popular and advanced skills and technologies, and to take the practical engineering technologies as its main range of coverage.